We offer support to people working together to tend to our local creeks. Do you want to help rid a local creek from trash pollution? Would you like to help improve habitat at our creeks by caring for the California native plants. Conducting creek clean-ups is a rewarding adventure full of fun and hard work that acheives real benefits after only an hour! . 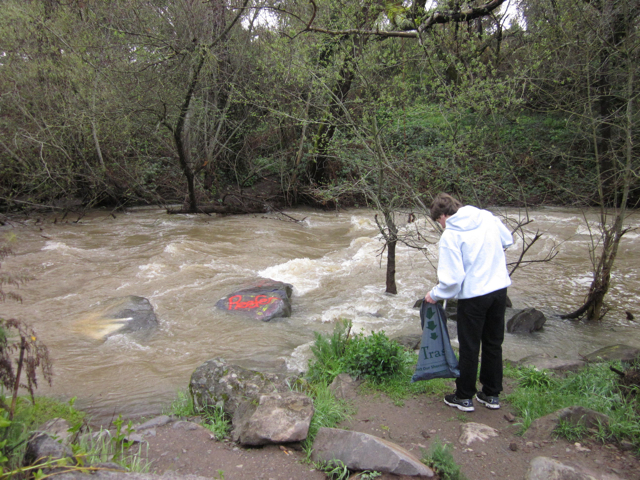 Working to free our creeks from trash pollution is a necessary task for a healthy people and creeks. Our creeks benefit when we working together to improve it's health. TEAM - Teaching Environmental and Agricultural Memories. This program is co-created with the Gold Ridge Resource Conservation District to give Sonoma County elementary school classes hands-on local education and experience with local agriculture and natural resources. As part of the TEAM Program, students receive a program-specific workbook, on classroom visit and one field visit. Classes are focused on one of three sites and themes, (1) Bianchi Dairy, (2) Gilardi Ranch or (3) Dutton Apple Orchard. June 1, 2013, 9:00 am. This small town's big event will see Envirichment volunteers parading together again this year! 2012 was Envirichment's first year in the parade and with over 60 people parading together, we were impressive. We were the final parade entry and carried signs while cleaning up parade debris, keeping it off the street and from flowing into Green Valley Creek. We had fun parading together- the route was over 1/2 mile long! Envirichment is available for consultation. We design, create and facilitate environmental education and action projects that meet your needs and site. With 17 years of naturalist, environmental education and stewardship program experience, Envirchment's proprietor, Stephanie Lennox is ready to help create your ideal program. (to find out more About Us, click here). Recycle Paper- We know recycling paper is a good thing. The more paper we recycle, the less new trees need to be used to make more paper. Learning how to make paper really brings home the point of how easy it is to "melt" down old paper and turn it into new. Students get their hands-on every step of turning old paper into new. Acorns and Oaks- For many years, Envirichment has been helping out the 3rd graders at this school learn about California's oak tree species along with how to prepare acorn for human consumption. The students participate in the many steps it takes to get a raw acorn prepared for eating.